Rugosa roses are tough. Books tell you they can be peppered by traffic pollution, or salted by sea-spray, and still thrive. Ha! 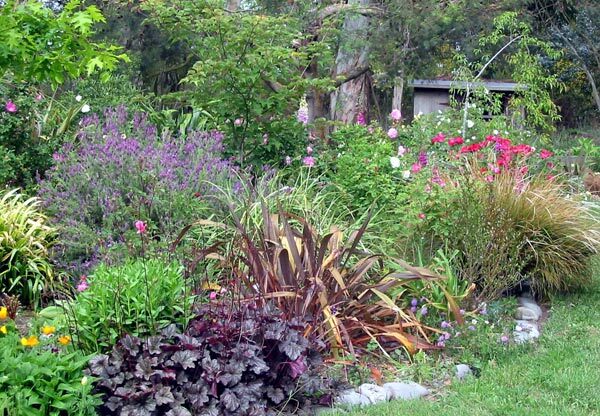 A novice gardener's license to plant them anywhere - underneath the Wattle and Eucalyptus trees by the hen house, for example. In my garden's earliest days I did just this. The Hen House Gardens had been freshly cleared, and I'd dug six established rugosas out of a neighbour's paddock garden. In they went, along with Phormium tenaxes (huge things), Pittosporums (shrubs that turn into trees overnight), and Scarlet Oak trees. And guess what happened? For the three or four years my rugosa rose garden flourished. My early photographs are sooooo pretty! But neglect, lack of water, and lack of soil enrichment (Wattles and Eucalypts are gross feeders) took its toll. And each year the oaks provided more and more shade. 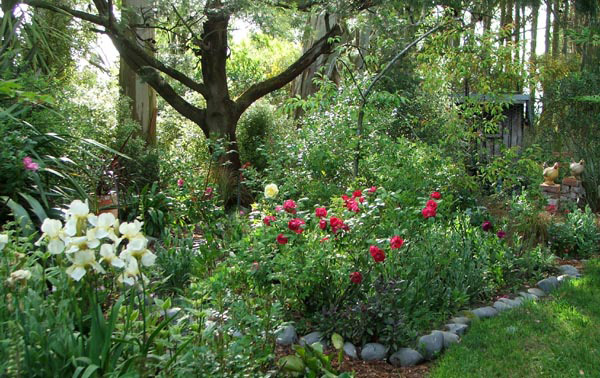 Several roses were shifted out into the sunnier edges, away from the gum trees. This cherry red is still there, though it, too may have to leave soon. Some of the originals didn't make it (including the supposedly robust hybrid Robusta). Others have been moved even further, with no records kept. Oops. But the gangly lemon Agnes and Roseraie de l'Hay are reasonably happy. Back in the original rugosa garden a pair of single whites (possibly the species rugosa alba) are still growing strong, though I do have to remember to water and feed them. I've learnt the hard way. Rugosas may be tough, but The Hen House Gardens just aren't quite the best spot in my garden for them. Oops.